I am transfixed by the ways art provides a path of transformation. Working through portraits, I capture moments of time in word and gesture offered to mark a place in the subject’s life journey. Art provides a way to find healing and empowerment in what is often most difficult. With subjects ranging from domestic violence to the environment, terminal illness and death, each portrait becomes a reference point—a marker in time and memory. I create each piece to offer a toe-hold from which to learn, to grow, to embody: a way to digest life and learn deeply from the moments it offers. 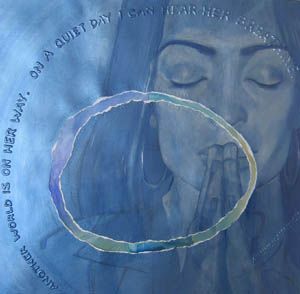 Each is a painted wish for our conversations to create the ripples of awareness needed for change. Cathy Salser, founder of A Window Between Worlds (AWBW), has spent the last 20 years working with battered women and their children, offering art as a resource for healing and empowerment. What began as one summer’s cross-country journey in 1991 to share the healing power of the arts has developed into a non-profit organization dedicated to using art to help end domestic violence. AWBW now involves over 100 women’s shelters providing art workshops to over 40,000 participants annually in 28 states across the nation. 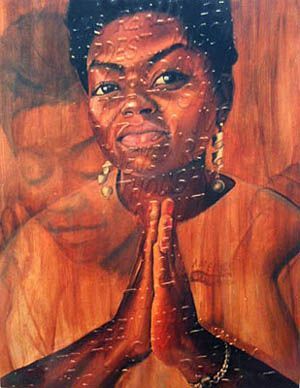 As Salser developed AWBW, she continued her own work as a painter, giving voice to numerous survivors made invisible by a society that does not prioritize the problem nor the victims of domestic violence. 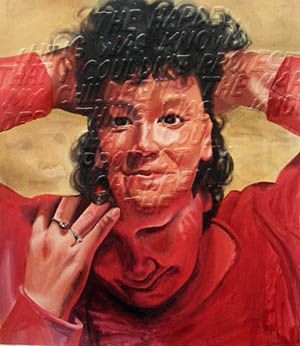 In her paintings for the Portraits of Survival series, she weaves together the images of women’s faces, hands and words to tell their stories of strength and hope. 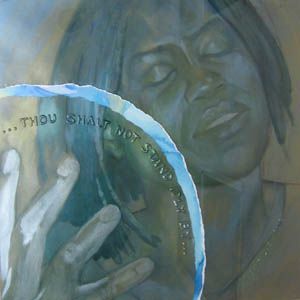 Salser exhibited these paintings at the Russell Senate Building in Washington, DC, where they helped launch National Domestic Violence Awareness Month in 1994 and then continued to break the silence surrounding domestic violence through additional exhibitions in 30 states. Salser participated in an SCWCA-sponsored EcoArtsLA exhibition at the Barnsdall Park Junior Arts Center in Los Angeles in 2007 by creating a series of portraits dedicated to the environment. In this series, each portrait marks a single conversation, a special window of time set aside for the subject to consider our impact on the earth and explore what we can each do to tilt the outcome at this crucial moment in the history of our planet.